I confess, I never liked sweet potatoes, but....OMG.....I absolutely love sweet potato fries!!! Sweet and Salty and Spicy all in one bite!! The combination of the spices give a rich deep taste that's delicious. These are crispy around the edges on the outside and tender on the inside, I just love these. 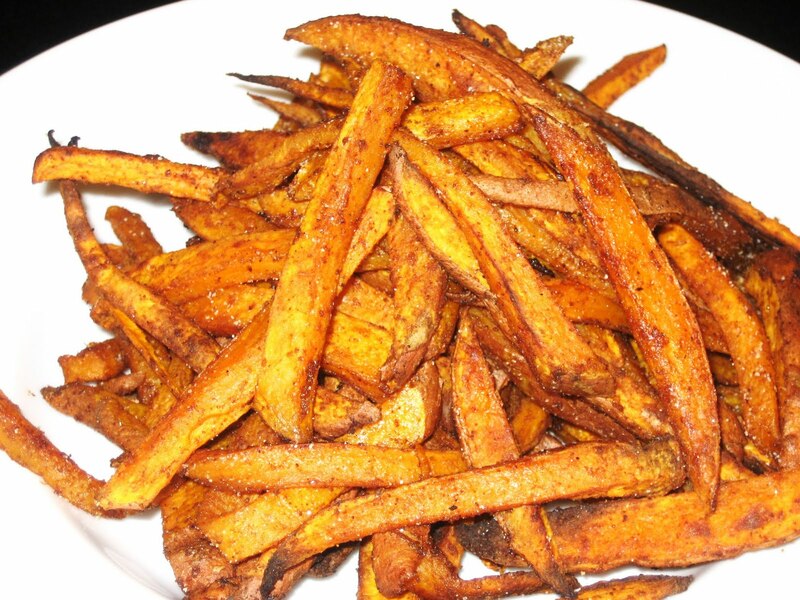 They are so easy to make at home and are much healthier than frying. All it takes is just 2 large sweet potatoes and you have a large batch of delicious sweet potato fries that you won't be able to stop eating;). Enjoy! 1. Cut the potatoes into 1/4″ thin strips, or to your desired thickness and length. Mix all other ingredients together in a large bowl and toss with the potatoes until they are evenly coated. 2. Transfer the potatoes to a large baking sheet covered with parchment paper. Spread the potatoes in a single layer. Try not to overcrowd or have multiple layers of fries — you want them to be roasted, not steamed. 3. Place in the oven and cook for 25-30 minutes, turning the fries once or twice during that time to cook evenly. May take more or less time, depending on the size and thickness you cut the fries. Remove once the edges slightly begin to brown and fries begin to crisp. Sprinkle course salt on top when they are hot out of the oven. You may have to adjust cooking time to get just the right amount of crispy.